Short but alot of fun! I loved the flying enemies, which were great tri purpose design. You want to avoid them, to not take damage, you want to kill them for money, and you want to keep them alive and under you so they fly up and give you a jump boost! Honestly can't say enough about how well that bit of design worked for me. On the other hand, the game didn't really feel very roguelike to me. It felt more just like any other platformer, where a death sends me to the beginning of the level. If you hadn't called it a roguelike i would never have associated it with them. Also, my world i played had such an insane amount of ghosts i felt like I had infinite jumps, which took away alot of the challenge. The non flying enemies just drop right on you with little feeling of counterplay. Good game. Didn't realise that it was procedurally generated each time you play until I accidently pressed esc and went back to the main menu. (This should probably have a confirmation). The flying enemies were good. The others were just rude, they would just drop from the roof and cause seemingly unavoidable damage. The jetpack should probably be bound to something other than space. I ran out by accident when trying to jump on ghosts. Using enemies to jump to higher places is a neat idea, it didn't really seem well executed as I found it easier to not bother. Misc notes: The art was nice. I like that you fell to the bottom when you died. Didn't realise that I had dropped the key when I died, actually died on purpose once I had the key to get to the bottom, made it to the door, then realised I didn't have the key anymore. You're right about the tutorial, it definitely needs to be improved. The pictures are small so it's hard to see what you're suppose to do and there should be some words to go along. If we were to redo the tutorial, it would be a proper tutorial level! 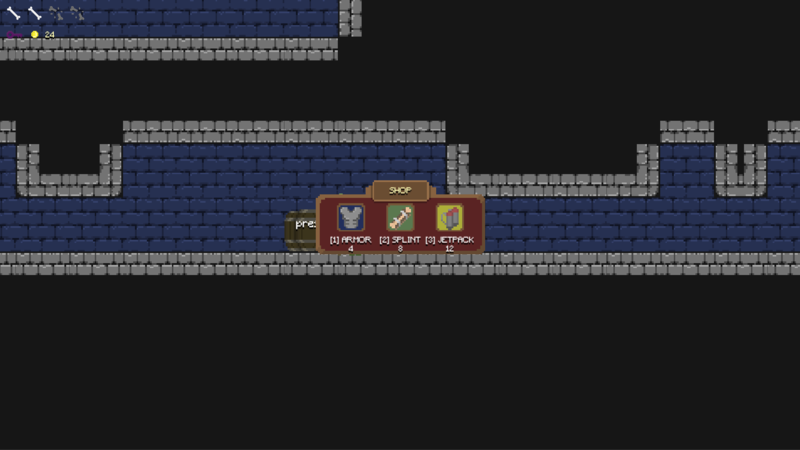 Though it purports to be a roguelite without death, I found that the falling from the top is basically identical to dying. It was pretty satisfying to run and bounce off of a bunch of enemies, which then let you doublejump, but mechanically falling all the way down to the beginning is pretty similar to death. Nice little game, the gameplay is quite good. Also bonus point for the character running animation, it's really smooth. My only real problem was the orcs coming from above which were too quick to react. The only part I actually disliked was the way the enemies spawn - since they already spawn chasing me, the game drifts between moments of waiting (because you need the enemies to use them as platforms) and being sandwiched by 4 enemies at once (the goblin-thing always lands on my head, for example). I mean, since you can't die, it never really gets annoying, but it might if you make a full game with multiple levels. I'd suggest working on that. Thanks for playing! We never got to do sound because I was completely occupied 24/7 with coding things that were new to me (like voxels and world generation). Given more time, I would have 100% made more sound effects. 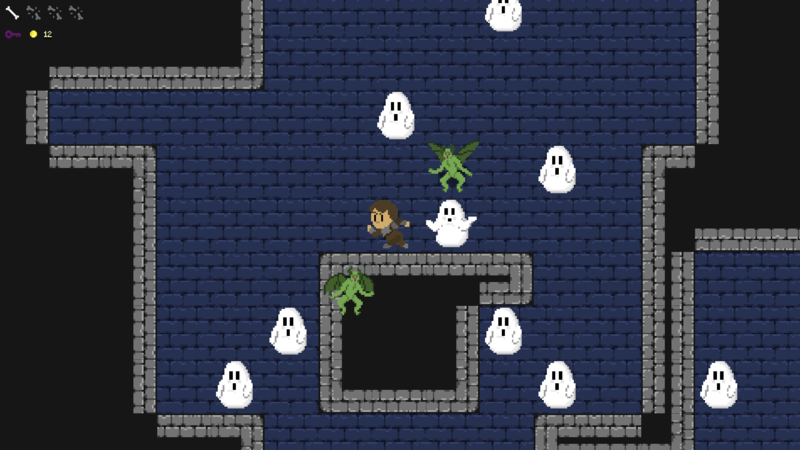 During our testing, we actually didn't have much of an issue with enemy spawning. You only have to use enemies as platforms to progress in about 10% of levels; usually, walljumping and ghost jumping are sufficient to reach almost any destination, and worst case scenario a single burst from the jetpack will more than make up for an enemy stomp. I hope you discovered the walljumping mechanic because we never stated it in game, and some of the people who we showed the game to didn't know they could jump off of walls! Oooh, alright. Yeah, I never saw the walljumping mechanic. Could have been the lack of feedback, but sure, now I guess I needn't have waited for the enemies. The jetpack I did use, if only a few times, but since I didn't know about the wall jump, I might have judged this aspect a bit innacurately. Also, yeah, doing new things you have no experience with is big trouble, but I think learning new stuff is part of the Game Jam spirit, so kudos for trying something different. Nice to finally see someone do the same concept as me! The game looks good and feels good, I love the determined face expression of the character when he runs. 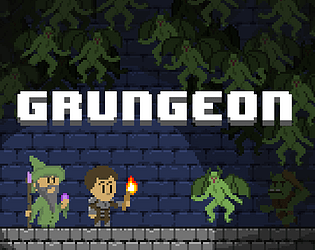 The dungeon generation was very impressive, it's challenging to do a fair generator for a platformer, great job with this! Despite many differences, the game gave me a strong Spelunky vibe, and I've appreciated the fluidity of movement very much. I'm sorry to say this, but I think your execution of the concept is flawed - this game consists of a single level, in which you climb to the top, so falling all the way to the bottom is kinda permadeath in disguise, you didn't really get rid of the mechanic. Overally it's a very well put together game, I've had a blast, great work! Thanks for playing, and I'm happy you enjoyed it! This game is definitely an early exploration of the falling mechanic. Without a larger level or more permanent aspects of the game that persist after falling, it does not feel quite right. 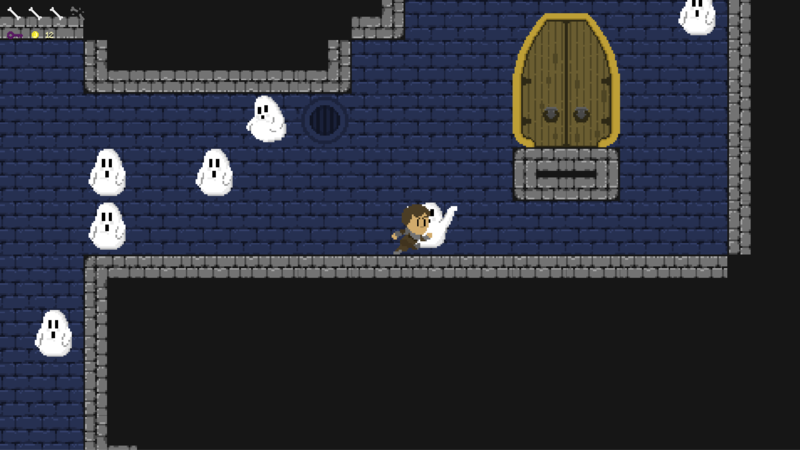 My idea for future iterations is that once you fall down, you have to go through the level again to get back to where you were, but the changes you made on your first run are still there (ex. getting gold and items, damaging/changing terrain, breaking enemy spawners, looting) alongside additional changes that automatically happen over time to previously explored areas (such as decay, flooding, being taken over by a new type of enemies, etc.). We definitely intend to keep evolving this concept in the near future. Great execution of the concept, even if it's a bit simple. Falling back to the bottom upon losing all your hp seems a bit too similar to respawning, but maybe in a more detailed context it might fit more snugly. Yea it is a little similar haha. Early on, we were imagining a more expansive dungeon and instead of falling all the way down, you just fall couple floors below. This was fun! I liked it. Although I admit it was a lil annoying that they could swarm and hurt you as you were shopping. I'm glad you enjoyed our game! I also agree about the shop. I think game should pause while you're in the menu. It was just something we didn't get to.